Are you having any conflicts with the Enfold Theme and Envira’s Automatic Gallery? If you’ve noticed that the images aren’t showing until you hover over them and you’re using the Enfold Theme as well as an automatic gallery, this tutorial will help you correct this conflict. This tutorial is a bit more technical than our other docs. In order to use Envira’s Automatic gallery with your Enfold theme, please review the steps below. There are a few ways to stop this conflict. One way would be to change the Number of Gallery Columns on the Configuration Tab from Automatic to any column count. Or you can create a plugin that has a filter to stop this conflict. To use the plugin, just add the following code to a new file at wp-content/plugins/envira-enfold-automatic.php. Your next step is to activate the plugin you just uploaded. 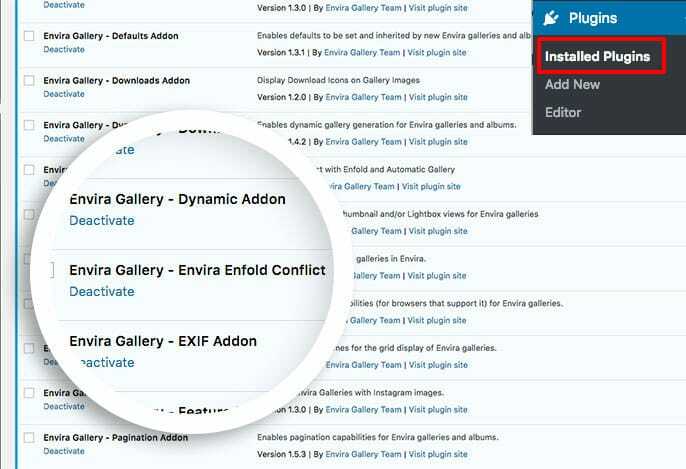 Simply navigate to the Plugins from within your WordPress dashboard and activate the Envira Gallery – Envira Enfold Conflict plugin. And that’s it, you’re all done! Would you like to try some more cool things with Envira? Check out our tutorial on How to style the tags filter using Envira Gallery and the Tags Addon.